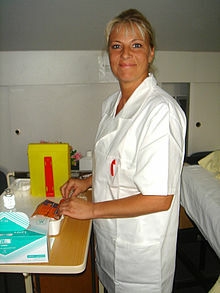 Many factors will influence whether the supply of nurses is adequate in coming years. The healthcare needs of an aging population is only one of them. “The growth in Accountable Care Organizations and alternative-payment models is probably the biggest factor,” Auerbach said. For example, as hospitals move away from fee-for-service medicine toward models that pay based on quality and cost-effectiveness, nurses’ roles may shift, and fewer of them may be needed in hospital settings as inpatient care declines. “Twenty-one percent of respondents plan to encourage use of accountable care organizations and another 26% are considering offering them. “More than half (54%) will offer health centers either on site or nearby. “Nearly nine in 10 (88%) plan to use centers of excellence for specified procedures like transplants or orthopedic surgery to take advantage of bundled payments and other alternative payment models. The surveyors found that 66 percent of employers will offer medical-decision support and second-opinion services by 2018, up from 47 percent this year, and 36 percent will offer high-touch concierge services. To read the survey results, please hit this link. To read Healthcare Dive’s commentary on it, please hit this link. According to a new report by Chilmark Research, fewer companies are offering clinical network management (CNM) solutions. Those that do have such solutions have moved from a “build it and they will come” approach to the question “can it help and at what cost?” Chilmark says. The report notes that the CMS’s focus on advanced payment (valued-based) models will further push providers to invest in technology to improve data interoperability and allow coordinated care among different provider networks. With more and more provider mergers and other partnerships, the need for networks to easily communicate with each another grows. So EHR vendors support more open platforms for data sharing. But widespread standards are needed for interoperability to reach the goals set by providers, regulators and policymakers. To read the Chilmark report, please hit this link. To read the Healthcare Dive analysis, please hit this link. The mantra for the last few years among many healthcare policymakers has been the need to focus on high-cost patients when looking at ways to slow healthcare costs. But in an article in the New England Journal of Medicine, the authors argue for taking a broader approach, especially for those in such relatively new payment models as Accountable Care Organizations. J. Michael McWilliams, M.D., a professor of health policy and medicine at Harvard Medical School, and Aaron L. Schwartz, Ph.D., a health economist at Harvard, write that more care coordination is essential and say that because system-wide changes may have varying cost structures, focusing on a specific patient group might not be very effective in cutting overall system costs. Among examples they give of areas for cost-cutting not involving a patient-group-centered approach, they suggest developing preferred networks of specialists or e-consulting systems that reduce unneeded referrals. They also said that providers could launch decision-support programs to cut the number 0f unneeded tests or prescriptions and improve triage to divert patients from emergency departments to outpatient clinics. To read their article, please hit this link. David Cordani, CEO of the giant CIGNA insuror, says its health plans under the Affordable Care Act work best when they are connected with the networks of physicians and hospitals in Accountable Care Organizations, The Hartford Courant reported. To read The Courant’s article, please hit this link. 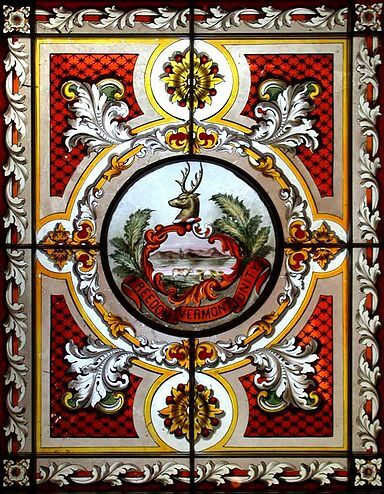 The Vermont State Seal in a stained glass window in the State House. Governing magazine has looked at Vermont’s development of an all-payer healthcare system, which CMG has reported on before. But there will be big challenges to making this work. To read the Governing piece, please hit this link. In a new report, Stackpole Associates has commented on and summarized data that the nursing-home industry has been avoiding for several years. Of particular interest to Cambridge Management Group is the effect on nursing homes of moving from volume to value, since CMG has been spending a lot of time in helping clients do that in recent years. We at CMG take issue with part of Stackpole’s remarks below. The implication that nursing homes will only be available for rich people is not correct. Strong skilled nursing facilities are emerging in the Medicaid sector. To read their report, please this link.